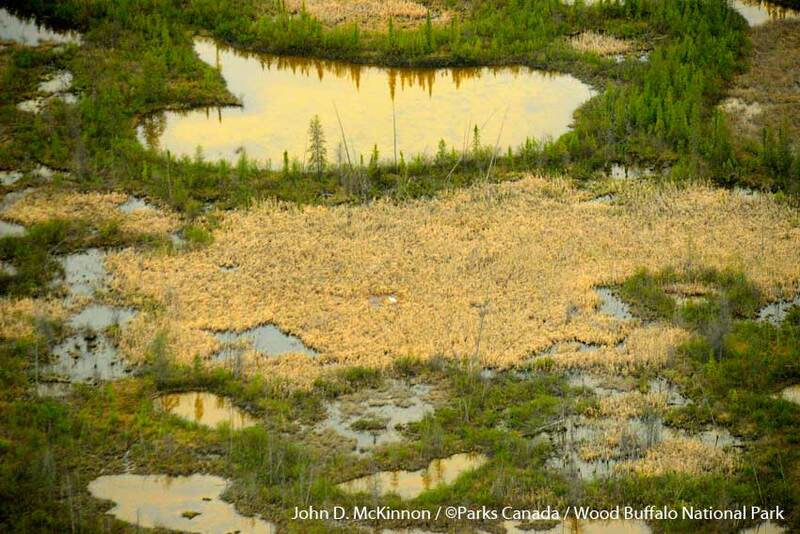 A total of 86 Whooping Crane nests were located during the 2018 nesting survey on Wood Buffalo National Park (WBNP), Canada according to Rhona Kindopp, Manager of Resource Conservation, Parks Canada. The next survey will be conducted in September to count the number of juvenile Whooping Cranes that hatched and survived. Notably, Kindopp pointed out that: “As the last natural whooping crane nesting habitat is under our stewardship, we play a central role in the nesting survey and in the fledgling survey that takes place later in the summer. Sharon Irwin, WBNP Resource Conservation Officer, WBNP Ecologist Lori Parker and John Conkin of the Canadian Wildlife Service took part in the survey, which was carried out May 25-29 for a total of 5 days. The vast wetlands in northern Wood Buffalo National Park are the whooping cranes’ nesting area. They build their nests alongside the shallow ponds that contain the frogs and insects they feed on throughout the summer. There, the nesting pairs will raise one or occasionally two chicks which must then make the long trip back to Texas in the fall. Canada’s network of protected areas play an important role by protecting and restoring healthy, resilient ecosystems and contributing to the recovery of species at risk. “The water levels in the ponds of the nesting area are good and overall habitat conditions look very positive this year. Clearly, the crane have found nesting conditions very favorable. Nesting started a bit later than usual this year because of cold temperatures.” according to Kindopp. Figure 1. Whooping Crane sitting on nest. Note crane in center of photo. ©Parks Canada / Wood Buffalo National Park. Due to the remote location of their nesting grounds and its inaccessibility to humans, the cranes are fairly secure while they are in the park. They face more challenges in their migration corridor through Canada and the United States due to habitat loss. We work with conservation agencies in the United States to monitor the progress of the cranes and share data on the state of their habitat. Whooping Cranes live a hurried life during their reproduction period. When the nesting birds (5 years of age and older) leave their winter habitats on Aransas National Wildlife Refuge on the Texas coast they seem to be in a rush. Spring migration periods from Aransas to Wood Buffalo are quicker than the fall migrations that travel south. The belief is that the nesters are in a rush to get to their nesting grounds so they can nest and rear their chicks during the short summer period available in their northern range. Wild Whooping Cranes have now settled down on Wood Buffalo. They arrived there during late April and May after migrating 2,500 miles from Aransas Refuge on the Texas coast. Each nesting pair located their nesting site which is normally in the same general area as past years. Park records show that several pairs have nested in the same areas for 22 consecutive years. Soon after their arrival on their nesting grounds, they build their nest. 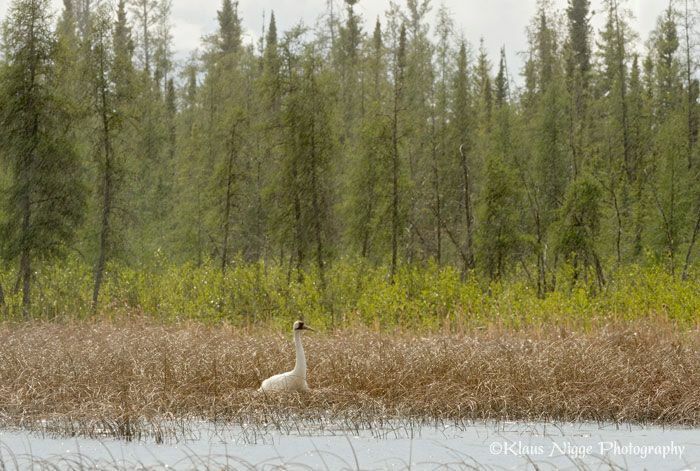 Nesting territories for Whooper pairs vary in size but average about 1,500 acres. They guard their territories. Nesting neighbors typically locate their nest at least one-half mile away. Nests are normally constructed in shallow water with vegetation from the local area. According to several research reports, eggs are typically laid in late April to mid-May. Normally two eggs are laid but infrequently only one and rarely three have been observed in nests. Incubation begins when the first egg is laid and continues for about 30 days. Since incubation starts when the first egg is laid, the first chick hatched is about two days older than the second hatched. This variance in age is significant and creates problem for the younger chick. It is weaker than the older chick and has difficulty keeping up as the adults move around searching for food. The younger chick often dies due to its weakness. Records indicate that only about 10% to 15% of the second chicks hatched survive. Importantly, the second egg plays an important role in providing insurance that at least one chick survives. From the time Whoopers begin egg laying until their chicks are a few months old, the family groups remain in their breeding territory. They feed there and don’t move long distances until after their chicks fledge. 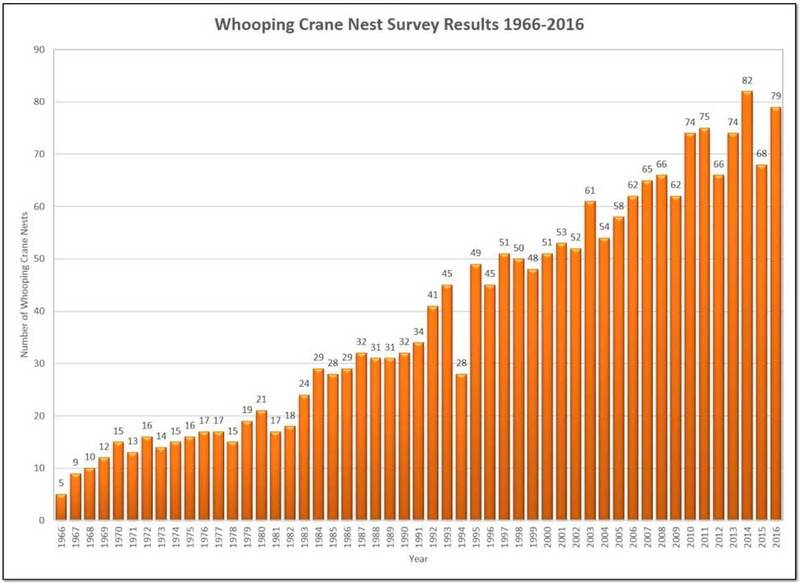 Nest survey results for the period 1966 to 2016 are shown in the graph below. Figure 2. Nest survey results for the period 1966 to 2016. Figure 4. Whooping Crane on nest in Wood Buffalo National Park, Canada. Parks Canada is a recognized leader in conservation. Through its Conservation and Restoration Program, Parks Canada takes actions to preserve national parks and contribute to the recovery of species-at-risk. 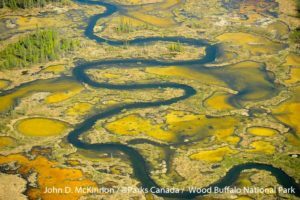 Canada’s network of protected areas play an important role by protecting and restoring healthy, resilient ecosystems and contributing to the recovery of species at risk. Friends of the Wild Whoopers will publish an update of the ongoing Whooping Crane chick reproduction and related activities soon.